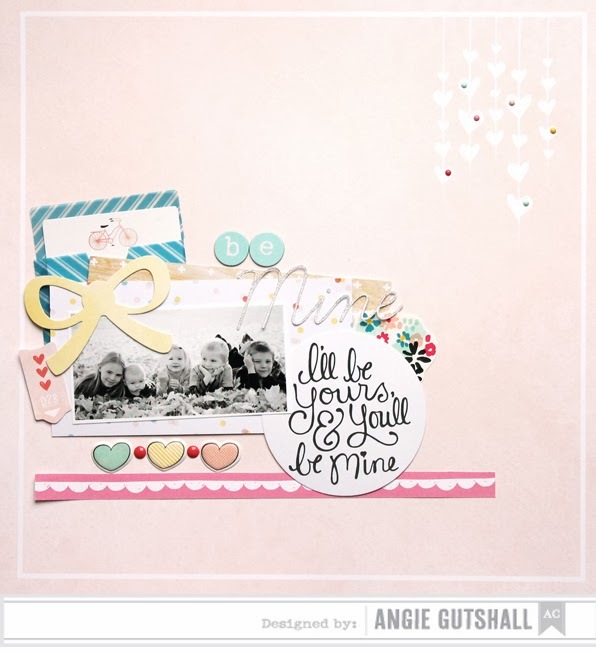 Love that Deat Lizzy collection and your beautiful layout! Welcome to the American Crafts Valentine's Day Blog Hop!! Here is my layout using the new Dear Lizzy Day Dreamer line. I LOVE the adorable sayings in this line. These are my Valentine's!! Here is a list of the American Crafts Designers for you to hop too! Now for a little giveaway from me!! Leave me a comment below to win this collection of American Crafts DIY and I will pick a winner Monday Feb. 17th!! Love how you used the products. Such sweet LOs. Thanks for the chance to win. I love your layout, so simple and so beautiful. Angie, this is so soft and pretty! That photo is just lovely! This is gorgeous, Angie! So soft and sweet! oh my SWEET--this is BEAUTIFUL! Such a sweet layout -- love it! SOOO pretty and sweet! And LOVE the black and white photo - perfect choice! Happy Valentine's Day!!! beautiful project. Happy Valentine's day! This is absolutely darling! love it! this is adorable! thanks for the chance! Gorgeous page! Sweet photo of your kids! The title works so well with the rest of your page! Beautiful photo - and the simple and soft background fits it perfectly. Too cute Angie!! Great use of the new Dear Lizzy, and I love how you added the tiny enamel dots to the hearts!! Love the sweet, soft feel of your layout. Happy Valentine's Day! Very sweet and simple. Love it! Such a sweet page! Love the softness of the layout, and that cute photo is just precious! Fun, thanks for the chance! I enjoyed spending time on your blog and I love ALL of your layouts!!!! Lovely page without being over done. The gorgeous photo of your blessings is the best part of this lovely layout. Adorable layout! The new Dear Lizzy Day Dreamer line is so beautiful! Thanks for the inspiration and for the chance to win!!! So very pretty....love the little hearts! GORGEOUS photo and ADORABLE layout!!! Love the little enamel dots on the hearts! Super sweet...I love your layout...the cluster of sweetness frames your darling picture wonderfully! Love this layout so much!! Loving your page Angie! I really like how you added those tiny dots to the corner hearts- adds just that little something. You have got some sweet Valentine's! Beautiful! Love the clustering around photo! Darling page to show off your little blessings. Pairing the black and white photo with the subtle pink was a great idea. You truly are blessed! Sweet page! Love your design and you have truly been blessed! What beautiful blessings you have! Love the simple beauty of this layout!! What a great and subtle use of embellishments!! This layout is GORGEOUS. I love all of it so much!! Love this sweet layout and especially the hanging valentines! That is a fabulous photo and an equally fabulous layout! Pretty layout! I love the soft colors and layering. sweet and simple layout.....love it!! Super cute ideas and AC product! So beautiful! Love the photo! That photo pops off the page it's so lovely with all the layers around it!! Beautiful layout with a gorgeous photo !